I bought and read this book when I was approaching the first engagement where my role would be solely to coach. In nearly three years at ThoughtWorks, all of the projects I had worked on until January were either pure software delivery, or co-sourced delivery, where coaching of the team was a happy side effect of the work we did. The book is straightforward and easy to read. The content is broken up with lots of short stories and examples, which I really like – I find this helps to understand the points better. There are lots of practical recommendations and exercises for how to achieve this, which was great because it was immediately useful and applicable – I often found myself wanting to get into work and try out something the book had suggested. Alongside this, the authors pointed out common hurdles to introducing new practices, often illustrated with examples from their own experience. I also enjoyed the chapters on development. The book isn’t a technical read and doesn’t try to be, but I thought it dealt reasonably well with the social issues around collective code ownership, refactoring, incremental design and pair programming. Each of the chapters in the book is self-contained, so you can either dip in to the bits you want or read it from cover to cover. I can’t really point to anything I disliked about this book! For more experienced coaches, it might not be as useful – I don’t think it contains anything groundbreaking or new. 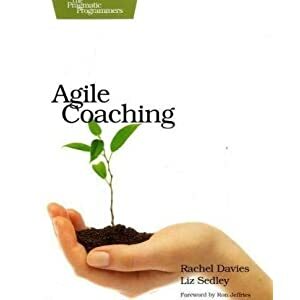 I would definitely recommend this book for anybody looking to start coaching Agile, looking for a good general read on the subject or some tips and techniques for introducing Agile to a team.